Hiding in plain sight in Sydney’s Centennial Park, Tomaso Sani’s We won! (1893) is the first monumental sculpture of a footballer erected anywhere in the world. Commissioned by New South Wales premier Henry Parkes in 1891, it is often mistaken for an emblem of ‘muscular Christianity’. But Parkes’s commitment to public sculpture, his personal involvement in the planning of Centennial Park and his growing prominence in the Australian federation movement meant that this commission had deep political significance. We won! 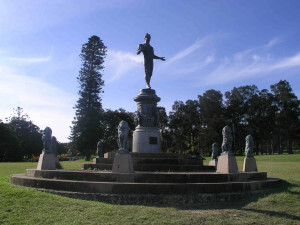 was the culmination of Parkes’s career-long support of public sculpture in Sydney; he was involved in around half of the statues erected in the second half of the nineteenth century. Its athletic subject reflects Parkes’s belief in the emergence of a virile, native-born generation. Rather than merely representing an athlete, the statue embodied the theories of Parkes’s friend Thomas Hughes (author of Tom Brown’s schooldays); the footballer embodied ‘faithful endurance’ in the face of personal weakness and political conflict. Envisaged as an ‘expression of victory’, the young footballer ultimately represented Parkes’s personal and political triumphs over poverty and factional opposition. While Parkes’s always insisted that he wanted no monument erected in his own honour, We won! is his surrogate memorial. Read the full article in Journal of Australian Studies, 37:4, 2013, 520–534.